You are not logged in. 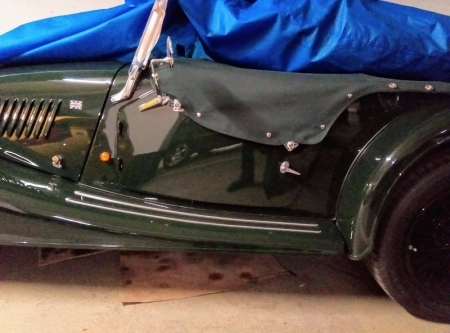 [Log In] Talk Morgan » Forums » Morgan Sports Cars » Morgan Photo Gallery » Short or Long Door??? 9 registered (RoyH, Stewart S, Richard Wood, mph, RJW, Shooter, revb, meabh, DCH), 136 Guests and 17 Spiders online. Short door 99.5% sure. Black painted bulkhead. Wings are harder to identify but I would go with hand formed. Looks short door to me. Tonneau cover looks well back from windscreen. On My later long door it is very close. No demister vents as no room, hence heated screen. Do you have demister vents? Looking at Roland's other picture posts, I would guess it's a long door. Looks quite similar to mine, no demister visible and top roll and door uppers look almost identical to mine. Is there that much of a length difference between short and long? Looks short to me, the room behind the door usually identifies them for me. This could have been manufactured during the changeover period, so may have inherited features from both short and long door models. Just a thought. I also reckon it's a short door, given the gap between the tailing edge of the door and the leading edge of the front wing and the lack of stainless bulkhead. The windscreen frame is also the old style. Probably one of each, Graham! ...end of ´96 / early ´97 short door would be my ..bet. As before I think this is a hybrid of the two styles. No demisters and heated screen would point to long door. The indicator repeater on the scuttle , the painted bulkhead (and valances) are typical of a short door. The gap between door and wing is more difficult to assess from a photo, but it looks like a short door. So I think you have a (unique?) mixture of the two styles.